Evidence-Based Practice is a term that is often bandied about but rarely understood. During the Library Lunchtime Learning session in September, we hope to clear up some of the mystery by taking attendees step by step through the EBP process, from identifying the clinical question through evaluating the decision made. Other topics of conversation include the resources that are most helpful for answering EBP questions as well as barriers to implementing EBP. We hope you can join us at either workshop. 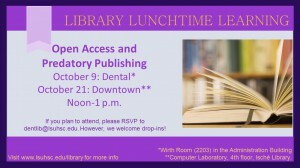 If you plan to attend, please RSVP to dentlib@lsuhsc.edu. Tags: events, evidence-based practice, Library Lunchtime Learning | Dental Library, Library Events | Permalink | Comments Off on Learn at the Libraries in September | Posted Friday, September 5, 2014 by Premo, Rita L.
If you’re free at noon today, drop by the Computer Laboratory on the 4th floor of the Isché Library and learn about scientific writing and scholarly publishing. Hope to see you there! Tags: Library Lunchtime Learning, scholarly publishing | Library Events, Tips | Permalink | Comments Off on Don’t forget today’s Library Lunchtime Learning | Posted Tuesday, August 19, 2014 by Premo, Rita L.
Thinking about turning that interesting case into something publishable? Wanting to report your research results to the world? The Library Lunchtime Learning sessions continue in August with a look at Scientific Writing: The Basics. Come learn about the difference between an impact factor and an altmetric, the structure of scientific writing, considerations for selecting a journal, materials you may need for submission, copyright matters, and much more. If you plan to attend, please RSVP to dentlib@lsuhsc.edu. However, we welcome drop-ins! Tags: Library Lunchtime Learning, scholarly publishing, writing skills | Campus News, Library Events | Permalink | Comments Off on Learn about scientific writing in August | Posted Wednesday, July 30, 2014 by Premo, Rita L.